It is hard to decide what is more striking about Richard Singh's clothes: the bold colors, traditional Indian accessories worn with classical Western attire, the flawless cut or the provocative messages on the cotton T-shirts quoted from the United Nations Bill of Rights. The fashion stylist-turned-fashion designer has made waves with his first collection of men's wear and launched a women's collection last year. Singh (inset) was born in Trinidad to an Indian father and a French-Spanish mother. Ignoring his parents' disapproval, he left for Toronto, Canada, to study fashion at the Seneca College of Applied Arts. Later, he moved to New York to become a fashion stylist with artists like Julia Roberts and Catherine Zeta-Jones and companies including Nine West, Neiman Marcus and Victoria's Secret. In an interview with Shakti Bhatt, Singh talks about dealing with racism, the influence of India on his work and why fashion in America is no longer about what it should be. I was 11 or 12 when I got into sewing. I was listening to the British invasion at the time. I started playing around on my mother's sewing machine around that age. She was always sewing. I started to learn the craft from her. By the time I got out of high school, I decided to go into fashion. After being a fashion stylist for 8 to 9 years, why did you get into designing clothes? I became a stylist because I liked the idea of your eye working as a camera and visualizing how each thing will look on print or film. But the work was not satisfying. The superficiality caught up with me. I wanted to do more meaningful work that will have an impact on people. What really pushed me toward my first collection were the hate crimes and racial incidents against people who looked like South Asians or Middle Easterners. Why did you decide to start your own line instead of going for the more conventional path of working for a designer first? Just a question of different sensibility I guess. Designers tend to like their employees to fit into their mold or image, which I can understand, but I can't exactly say that I have lived or related to the kind of lifestyle American designers sell. There was no American designer I wanted to work for. I like to be my own boss. What did you think of the spring collection for 2004 that opened last year? The recent shows in New York were more of the same old thing we have been seeing for the last few years. Even when I worked full time as a stylist, I stopped attending the shows here about three years ago, simply out of lack of interest in what I was seeing. At which point did your father begin to accept and support what you wanted to do? Even though I always wanted to design clothes, I can't say it was something I was ever encouraged to do, and early on was in fact dissuaded from doing anything related to fashion. My father was against it. He didn't think it had any value. He thought it was silly. Now, I'd say my greatest support team is my family, and could not have started my clothing line without their help. Does your background as a stylist help you as a designer? When I design a collection, I still style and art direct the presentation which is in the form of a book. I'll always use the knowledge I've gained as a stylist when I design. Working behind the camera for all these years, my eyes have been trained to see things in a certain way that most designers don't see. [Celebrated stylemaker] Polly [Allen Mellen] and I have worked together on and off over the last 10 years. From the day we met, she has been my greatest supporter and source of encouragement. She saw something in me that I thought only I saw in myself. Do you plan to make clothes for the average person who cannot afford to buy a $2,000 suit or dress? There are pieces in my collection that most people can afford, though the people who wear the clothes are anything but average. I'd like to reach a wider audience. Once my web site is launched in spring 2004, a suit that may retail for about $1,600 will be available for under $1,000. I went to India in 1997 and was amazed at the colors, at the saris, that one piece of cloth which embodies so much. What can you say about your first men's wear collection? This collection is about human rights and racial profiling. It's for one thing and against the other. I have used the original text from the UN Bills of Rights. I also volunteered for Amnesty International which influenced my work in part. The most important thing about my collection is that it's not about clothes but about people. People are not being shown equally or being represented equally. First and foremost I am a human rights activist. first collection was more well received by Europeans than Americans, I guess because of the statement I was making and the fact that I used a Sikh as one of my models. A lot of Americans misunderstood it. They thought I was trying to represent the terrorists. It is an ignorant way of thinking. During and after the shooting I was trying to avoid a lot of press. A press that is run by a certain ethnic group that is definitely not Indians (laughs). I don't completely blame 9/11. There was racist behavior before but of course it was nothing like what happened in the five or six months after the attacks. But I have begun to understand race issues better now. The whole idea of New York as a melting pot and as a place where race and color does not matter is not true. Europeans are much more open and embracing. Did you experience racism growing up? I grew up with racism and was tortured nearly every day in school growing up, so I have a very deep understanding of what it feels like to be hated and the paralyzing effects it can have. I grew up with a younger sister and I was lucky to have green eyes. Still, you were made to feel embarrassed about who you are. When I made a trip to India around 1997, it gave me back my sense of pride. comfortable here than I once did. How would you describe the fashion industry in the US? The fashion industry in the US is a mirror of American culture: money, celebrity, quick fix. In New York, fashion is in a dreadful state. The emphasis is on commerce. These days fashion has come to mean seeing the same thing over and over again until you can't bear to see it any more. 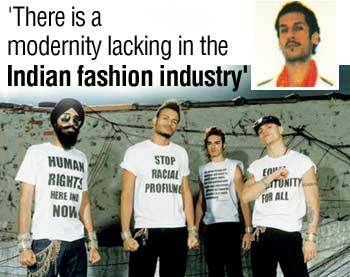 What about the Indian fashion industry? There is a certain sophistication and modernity lacking in the fashion industry in India. But they will catch up soon. With the kind of portfolio you have created using a Sikh model and writings from the US Constitution, do you feel like a trendsetter? A trendsetter, yeah. This has not been done before. I mean the strength of the collection not necessarily the statement. As a stylist I found myself shooting white girls with blue eyes all the time. As a kid when I was growing up I did not see anyone look like me. You basically grow up being somebody else or trying to be somebody else. I have tried to show the racial and religious diversity in my catalogue. Besides the Sikh guy, there is a Catholic guy, a Jewish guy, a Muslim and a Puerto Rican. What can you tell us about your women's collection? I always wanted to design for women even though the market is over-saturated. I have used Indian stuff in a modern way. The sari is cut in a way that a young girl can wear it to a dinner. Right now the ethnic clothes are done too ethnically. I am crazy about polka and about antique saris. Which fashion designers do you admire? Jean Paul Gaultier, Karl Lagerfeld and Monsieur [Yves] Saint Laurent. I am equally influenced by what is going on in the world socially and politically, as I am by the films that I watch, the books that I read, or the streets that I walk. Who are some of the people, male and female, that you would like to dress? [Musician] Lenny Kravitz, [U2 lead singer] Bono Vox, Masjed Al Sabbah, [Hollywood actresses] Nicole Kidman and Gwyneth Paltrow, and [actresses] Padma Lakshmi and Aishwarya Rai. That's a very important question. I would like to be a part of the international movement, the struggle for racial tolerance. I would like to be seen as somebody who gave the message that it's okay to be who you are. If you come from India or Turkey you don't have to assimilate yourself. You can dress in a way that reflects your heritage. Being modern is important but to modernize means taking from tradition and not forgetting about it.